Every clothing manufacturer cuts, sizes, and styles slightly differently. 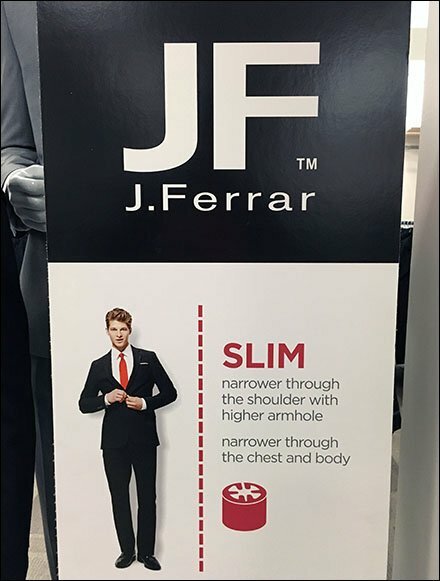 To all the better dial you into their range is this Size and Style Guidance In-Store by J. Ferrar. But in addition to size, it projects the JF fashion statement, which fresh for now, has historic roots in the stylish suits of the “Mods” of the 1950-60s. Me? I sadly confess to probably being a bit beyond even the JF Classic Cut in size, needing more of a Loose Fit. But JF is right on target for their style demographic and says it clearly. I admire the “Mods” style though they pre-date even me. See more Size and Style Guidance In-Store by J. Ferrar in the gallery of images.